Kilkenny trailed at the break of today’s semi-final, but ran out 12-point winners. HENRY SHEFFLIN RETURNED to the Kilkenny line-up today and helped his side overcome a powerful Galway first half to claim an ominous 1 – 24 to 0 -15 win and a place in the Walsh Cup final. Shefflin came away with 13 points in all (12 from frees), including 10 in a second half which saw the Tribe limited to just three points. Kilkenny got off to the perfect start when Colin Fennelly blasted in an early opening goal to give his side a 1 – 1 to 0 – 1 lead. The Tribesmen had soon chipped that advantage away through points from Niall Burke and Niall Healy and they claimed a 0 – 8 to 1 – 4 lead to send them into half-time with momentum and a commanding advantage of 0 – 12 to 1 – 5. The 2000 strong crowd in Freshford would not leave disappointed, though. The 20 minutes after half-time proved a devastating period for Galway as they lost that window by 10 points to two with Fennelly, Shefflin, JJ Farrell and Brian Hogan each putting their names on the board before Healy grabbed his second of the half to make it 1 – 15 to 0 – 14. Shefflin would add two more to his day’s tally before Eoin Larkin brought the Cats to 1 – 20 with five minutes to play and from there it was a procession to next weekend’s Walsh Cup final where they will meet Dublin, who defeated Wexford by a point in Gorey today. Email “Baker's dozen for King Henry as Cats surge past Galway”. 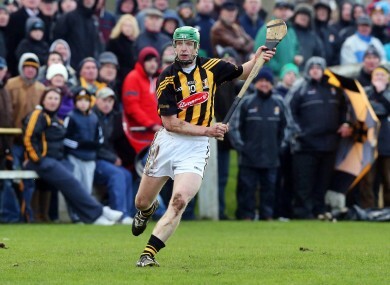 Feedback on “Baker's dozen for King Henry as Cats surge past Galway”.